How Do Australian Shepherds Do In Storms? How do Australian Shepherds do in storms, generally? Do they handle the storms well, or get super-nervous? 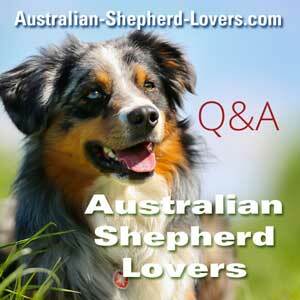 Comments for How Do Australian Shepherds Do In Storms? Depends on the individual dog and how they were exposed to their first thunderstorms and how they were treated during thunderstorms. My own 7-year old Aussie has not had a problem with thunderstorms, and we live in south Florida where there are LOTS of them. The woman who owns the parent dogs started the pups off right, and I think that may have helped. Many people have had good results with the ThunderShirt to help keep their Aussie calm during times when loud noises are occurring, like during thunderstorms and fireworks. There is an article about ThunderShirts here. I've found if I react to something in fear my Aussie will pick up on it and do the same. When we first brought our rescue Aussie home he was nervous about fireworks etc but just talking to him in a soothing voice telling him nothing to worry about he eventually calmed down,and now it's no big deal for most things he encounters that are frightening or out of the normal. I have an Aussie. He is 8 years old and he does not like storms at all. He pants and cries. We have him on meds but still does not like it! Jake is 2 years old. He is fine in storms. No issues...curious about the sounds, BUT normal for the most part.